Blaine Klingenberg enjoyed the small things in life. He was always one to strike up a conversation, he took great pride in mowing his lawn and often had a bowl of Frosted Flakes before work. 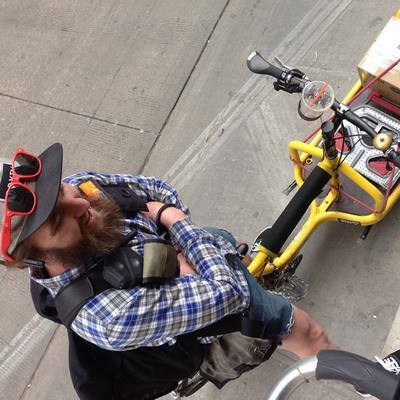 So, it came as no surprise that the 29-year-old decided to head to Oak Street Beach to meet up with friends after a long day delivering packages on his cargo bike for Advanced Messenger Services last June. Tragically, he never made it to the lake. While riding north on North Michigan Avenue during rush hour, Klingenberg was struck and killed by a double decker bus at East Oak Street. Klingenberg was rushed to Northwestern Memorial Hospital after firefighters used airbags to lift the bus off him, and was pronounced dead a short time later. The driver of the bus wasn’t issued a traffic ticket or citation. Witnesses say the intersection was gummed up at the time and that the bus driver did not have the right of way (a current wrongful death lawsuit filed by Klingenberg’s father against the bus company is pending). With seven lanes on Michigan and a larger-than-average intersection to accommodate the North Lake Shore Drive on-ramp, it’s easy to imagine how the possibility for a crash is much greater than a standard 4-way signalized intersection. Two weeks after his death, friends, family and the Chicago Bike Messenger Association organized a memorial ride to honor Klingenberg. More than 200 cyclists joined in to pay their respects, including a handful of Klingenberg’s family members who flew in from Bakersfield, California. Even his grandfather, who hadn’t been on a bike in 20 years, rode the 12 miles with the group, and upon returning home purchased his own cargo bike, one much like Blaine’s. A memorial for Klingenberg was set up on the northeast corner of Michigan and Oak, but was taken down without explanation. The memorial was soon restored, including a white painted wheel chained to a pole, but by the start of November it was gone. Maja Perez, Klingenberg’s longtime girlfriend who moved to Chicago to be with him, said no one knows who’s been removing the tributes. Perez continues to commute by bike from Logan Square to Pilsen — something she sees as a strong statement — and is still getting used to life without Klingenberg and being in the Midwest. Photo of Blaine Klingenberg courtesy of Maja Perez. This post was written by Jeffrey Levine, a volunteer writer for Active Trans.